Canada's Prime Minister Justin Trudeau impressed many after concluding his speech at the India Day parade with a "rousing" chant of Jai Hind. 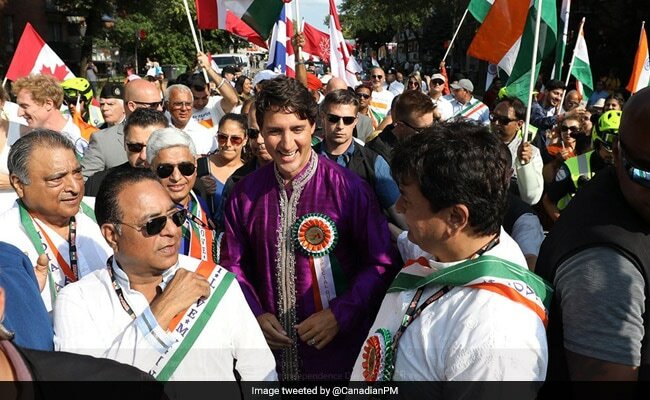 Canada's Prime Minister Justin Trudeau attended an India Day parade in his constituency of Papineau in Montreal, Quebec wearing a traditional kurta-pyjama on Sunday. He took to Twitter to share pictures from the parade celebrating India's Independence Day. Many complimented the politician for his sartorial choice. Mr Trudeau impressed many after concluding his speech at the parade with a "rousing" chant of Jai Hind. "Home in my riding of Papineau for Indian Independence Day celebrations! Long live the friendship between our two countries," Mr Trudeau tweeted from his personal Twitter handle. A picture of the Canadian Prime Minister in a bright purple kurta was also tweeted by his official Twitter handle. India's High Commissioner to Canada Vikas Swarup also attended the India Day parade. This isn't the first time Mr Trudeau has attended Indian Independence Day celebrations. Earlier this year, photographs of the Canadian Prime Minister wearing kurta-pyjama and performing puja at a mandirin Toronto went viral.